Classical audiences would never accept a star soloist playing a Bach Partita on a poor quality factory-made violin. So why does the same audience accept a similar degradation in sound quality away from the concert hall? Here is a spectogram of bell percussion - concert hall sound quality. 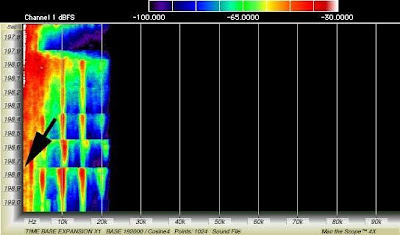 Now here is the same bell percussion after standard 44.1 kHz sampling for digital reproduction - poor quality factory-made sound quality. Both spectograms come from published research into the high frequency content of recordings and the second one shows how the savage cut at 22.05 kHz does very nasty things to the music. 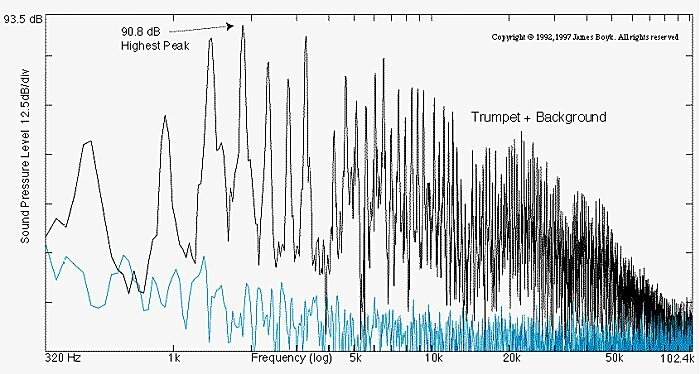 Below is the spectrum analysis of a trumpet which plots the ultrasound output extending to above 100 kHz, which is five times higher than the generally accepted upper limit of human hearing. But, as was pointed out in the first part of this post, medical research has now identified that the brain is receptive to frequencies considerably above 20 kHz. Ultrasound, which stimulates electrical activity on the surface of the brain, is transmitted both through the eyes and by bone conduction, with measurements showing that both paths handle signals to above 50 kHz (see references below). 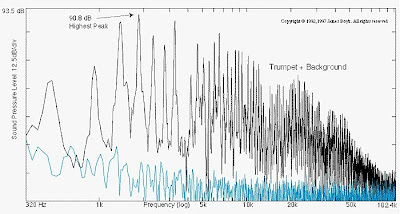 The graph of a trumpet's sound spectrum is reproduced from a research paper titled 'There's Life Above 20 Kilohertz! A Survey of Musical Instrument Spectra to 102.4 KHz' by James Boyk of the California Institute of Technology. In the paper Boyk reports that "at least one member of each instrument family (strings, woodwinds, brass and percussion) produces energy to 40 kHz or above, and the spectra of some instruments reach this work's measurement limit of 102.4 kHz" with a muted trumpet producing 2% of its energy above 20 kHz and a cymbal 40%. (Note that acoustic energy is a poor measure of importance as high energy sounds require less energy than low sounds). At this point let's pull together four unimpeachable facts. First, frequencies considerably above 20 kHz reach the human brain and enter the cognitive system. Secondly, the frequency range and power bandwidth of musical instruments extends considerably above 20 kHz. Thirdly, the standard sampling rate of 44.1 kHz used in CD and other digital formats blocks all frequencies above 22.05 kHz and creates a sonic 'black hole' - see diagram 2 above - that is quite unlike the gentle frequency roll off found in the human ear and analogue sources. And fourthly, CD, MP3 and other digital formats are now the de facto standard not only for listening to recorded music, but also for listening to music period. At which point it can safely be said, Houston we have a problem. Classical music has been covertly dumbed down by transparently commercial agendas through the imposition of digital recording and reproduction standards that detrimentally reshape the music. But it need not be so, because high-sampling rate recording technology and lossless digital file formats provide viable alternatives. In many ways the dumbing down of recorded sound is more damaging than the often discussed dumbing down of concert peripherals. Classical music is about sound, and when you dilute the sound you dilute the very essence of the music. Abandoning compromised digital formats and instead exploiting recent research into ultrasound could help new audiences feel the music as well hear it. Bone conduction of sound, the process which allows the profoundly deaf to 'hear' music, is fast becoming the new acoustic frontier. Not only does bone conduction transmit ultrasound but it also transmits low frequencies, and bass is one of the hot buttons for engaging new classical audiences. A reader jokingly tweeted in response to my first post on ultrasound "So I need headphones for my eyes apparently". But that is not a joke, because headphones for the eyes are already reality. Google - an organisation not to be underestimated - recently filed a patent for bone conducted technology linked to their Google Glasses project. Which is good because it shows this little-understood phenomenom is being taken seriously, but is bad as it raises the real possibility of Google gaining proprietary ownership of a technology that may provide the missing link between portable audio devices and classical music. 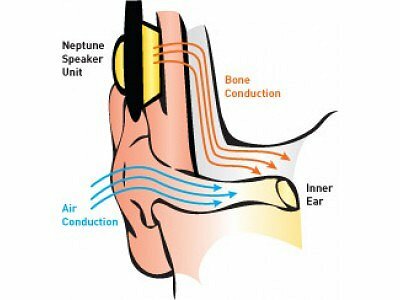 Bone conduction is also used in specialist hearing aids and in the Finis Neptune waterproof MP3 player which dispenses with ear buds and instead transmits sound through the cheekbone to the inner ear, see diagram below. This post can only hint at the little-explored paths that connect ultrasound, digital standards and classical music's inability to gain traction with younger audiences. In fact the interconnectedness is daunting, because this strand links via synaptic paths to the whole area of meta content and neuroplasticity. When I wrote about meta content recently I explained how research has shown that classical music needs to be a deep and content rich experience, yet dumbed down digital formats are the enemy of deep and rich sound content. My post on neuroplasticity was headed 'Research proves audiences become what they listen to' and we know that audiences now listen to compromised MP3 and iPod sound for much of the time. So, unless things change, not only will classical audiences become the music they listen to, but they will also become the sound they listen to. Which means that poor quality factory-made violins really will become the concert hall standard. There's nothing wrong with bone conduction research when it comes to helping people who have very little in the way of hearing, but for music it is SO MUCH MORE enjoyable to be able to hear it (and see it being played) in real time and in real space. No matter what the intermediate medium, whether it blots out a whole family of frequencies or not, the only way to really engage people in listening to classical music is to offer live performances of good music that is well played in an environment that doesn't have other distractions. No matter how realistic your uncannily realistic a jelly bean seems to taste, it doesn't have any of the nutritive value of the food it is tricking your brain into thinking it's tasting. There's a world of expression and nuance that is compressed away when it's recorded, even by the best equipment and the best engineers. My hope is that eventually people will realize that, and more people who spend their lives in search of nuance and meaning in their music making will have a way to make their livings through playing concerts for audiences who know the difference. [Engineering Report] Claims both published and anecdotal are regularly made for audibly superior sound quality for two-channel audio encoded with longer word lengths and/or at higher sampling rates than the 16-bit/44.1-kHz CD standard. The authors report on a series of double-blind tests comparing the analog output of high-resolution players playing high-resolution recordings with the same signal passed through a 16-bit/44.1-kHz “bottleneck.” The tests were conducted for over a year using different systems and a variety of subjects. The systems included expensive professional monitors and one high-end system with electrostatic loudspeakers and expensive components and cables. The subjects included professional recording engineers, students in a university recording program, and dedicated audiophiles. The test results show that the CD-quality A/D/A loop was undetectable at normal-to-loud listening levels, by any of the subjects, on any of the playback systems. The noise of the CD-quality loop was audible only at very elevated levels.